Nature’s Notebook was born of a spiritual connection to the ocean and its beaches. Drawn to the soft sandy edges of the sea, artist Courtney Noelle has always felt inclined to inscribe words or names, thoughts or dreams into the ever-changing landscape of the beach. Something about its tumultuous fate, an uncertainty that parallels our own lives, makes sea sand the perfect tablet for expression. And what better way to capture that expression, the memory and the magic of the beach forever, than in a photograph. Courtney Noelle began sharing these captured moments with friends and loved ones through gifts and cards. Soon, people were talking about these special snapshots, encouraging Courtney Noelle to make these gifts available to anyone. Touched, and eager to share this passion with the world, Courtney Noelle began Nature’s Notebook an online collection of photographs and cards using the seas’ tranquility to express love and emotion. My brother and his fiance both love the beach. Therefore, I knew that this would be the perfect and unique gift for them when they get married. 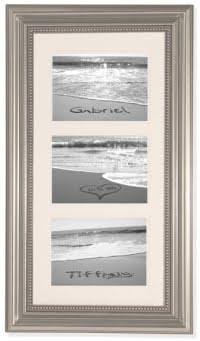 The first and last photo in the Who Heart Who (3 Photos) ($120) has their name written in the sand. I know that both will be thrilled to receive this gift. Not only because it showcases their love for the beach, but their love for each other as well! This memorable keepsake is bound to be treasured for years to come. You can have this done up in color or black & white – whatever suits your style! You can get this frameless for $30 less or get the Who Heart Who (3 Photos) in Black, White or Silver. You can have your Wedding/Anniversary Date added for an additional $12.